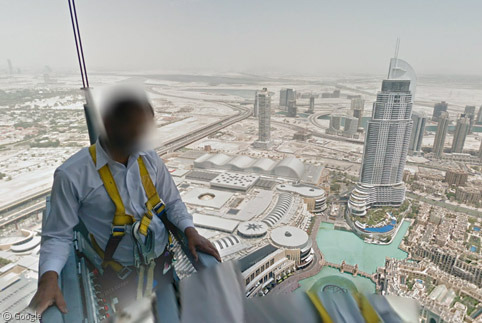 For the very first time, Google has released Street View imagery of the Arab world, and they’ve started right at the very top – with the highest man-made viewpoint on the planet, Dubai’s monumental Burj Khalifa. 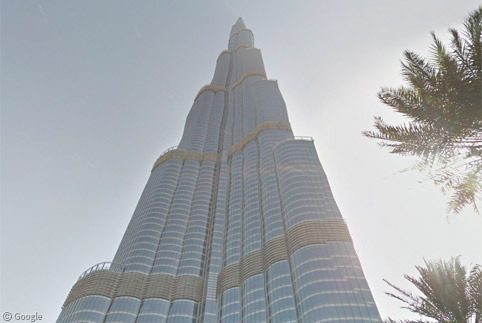 As expected, when it was completed the Burj Khalifa became the tallest ever manmade structure by a significant margin, topping out at a frankly ridiculous 828 meters (2,717 ft). Given how significant a building this is, Google weren’t simply content to just take pictures from ground level. 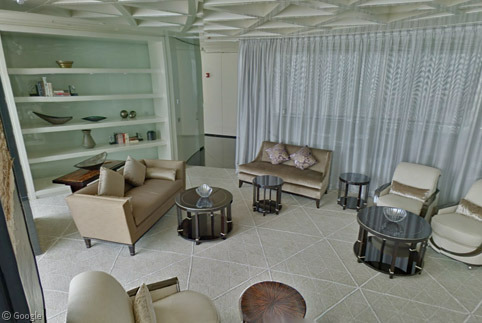 The team spent three days capturing imagery using the Street View Trekker and Trolley from several locations around and inside the building. The only public area of the skyscraper is called At The Top, and it’s accessed through an entrance inside the Dubai Mall (unsurprisingly for Dubai, based on total area it’s the world’s largest shopping mall). There’s a resonable distance to travel to the lifts, so there are several exhibits to pass the time while you wait in the queue. 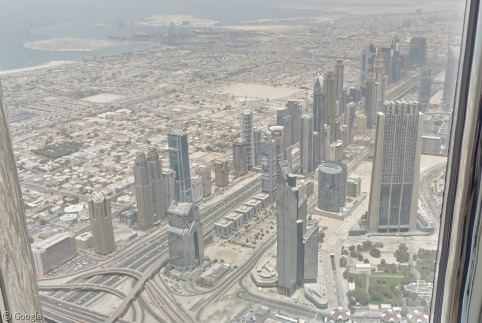 I was lucky enough to visit the Burj Khalifa in May1, and travelled up to “At The Top” in a lift that can apparently do 22 mph, but there aren’t any windows2. 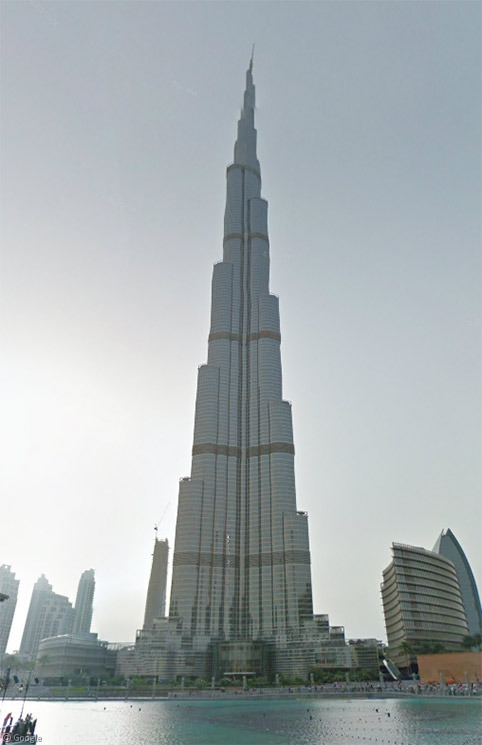 It’s on the 124th floor, meaning it can rightfully claim to be the world’s tallest observation deck. 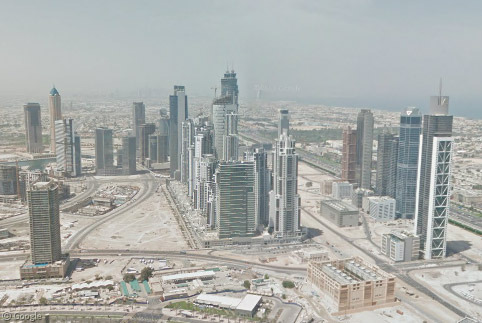 The views of Dubai certainly are spectacular (as I can personally attest). 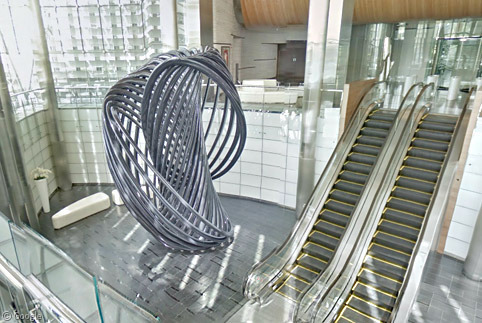 Annoyingly for those of us who paid the £22 entrance fee to visit a single floor3, Google didn’t just visit the observation deck – they also went to several other floors. 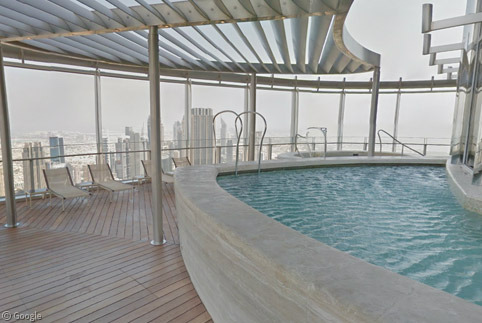 On the 76th floor Street View captured the second highest swimming pool in the world4. Don’t expect to be holding a swimming gala in there however – I’ve seen larger puddles. The camera crew also went to the 154th floor, which is the highest occupied floor in the world. It really is very high. 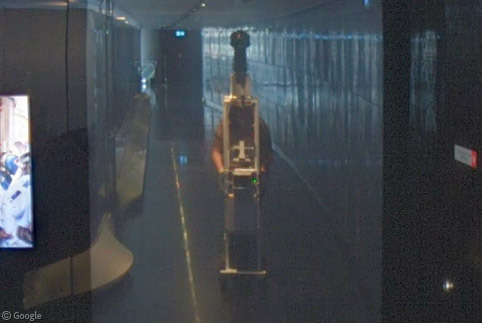 As if that weren’t enough, Google really shows off their influence next – they somehow managed to convince someone to let them take a ride on one of the building’s window cleaning units. This allowed them to take some incredible outdoor views of Dubai (note the Burj Al Arab way off in the distance). 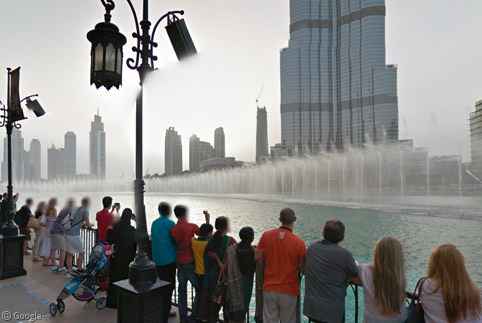 Once you’ve had enough of all the views, you can return to ground level to watch the spectacular displays of the Dubai Fountain, which is (naturally) the world’s largest choreographed fountain system. 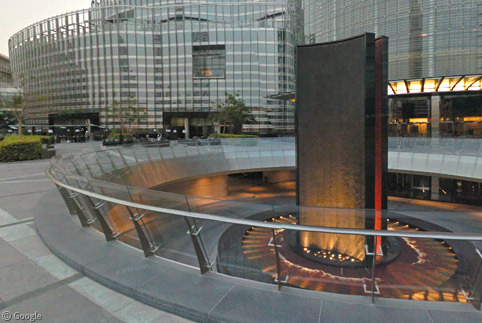 Designed by the company responsible for the Bellagio Hotel fountains, the system is capable of shooting water up to 152 m (500 feet) in the air. Real life tourists can opt to get a little closer up, and a lot wetter. Elsewhere around the grounds the Street View team have gained additional access to several other areas that are normally inaccessible to the general public, revealing even more oppulence at every turn.